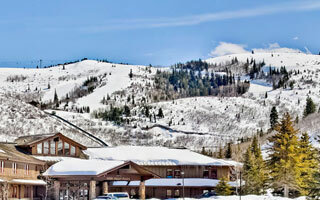 Double Eagle condominiums are located two to three blocks from Silver Lake Village, mid-mountain at Deer Valley Resort and are on the free Park City Transit route. Typically, these townhome-style condominiums feature a fully equipped kitchen, fireplace, hardwood floors, jetted tubs, washer and dryer, private outdoor hot tub on the deck, underground parking and complimentary wireless Internet. Guests can ski right up to the building via the ski access trail from Silver Link ski run. Ski-out access is available via elevator in the underground parking garage to a fairly flat ski access trail that leads to the Success ski run. The Signature Collection's complimentary in-town transportation, provided by Cadillac, is offered during the ski season.